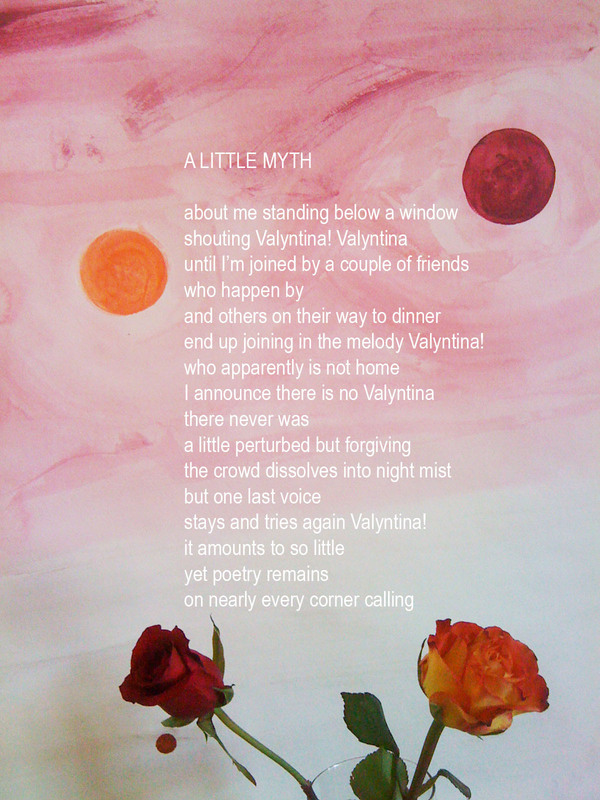 A LITTLE MYTH, text by Jane Miller, image by Valyntina Grenier, 30” x 23” Giclee print on Arches watercolor paper edition of 4, $350 framed $200 unframed. The love poem was a gift from Jane for our anniversary. The image in the background is from “Valentine,” a 65” x 43” acrylic painting on paper I made in 2009. The roses in the foreground were a valentine from me to Jane in 2011. This entry was posted in Acrylic, announcements, Events, Exhibits, Flowers, POETRY and tagged Acrylic, announcements, Events, JANE MILLER, POETRY, VALYNTINA GRENIER. Bookmark the permalink.